On Friday the 24th of February 2017, Care for Wild Rhino Sanctuary welcomed another orphaned rhino calf bull. 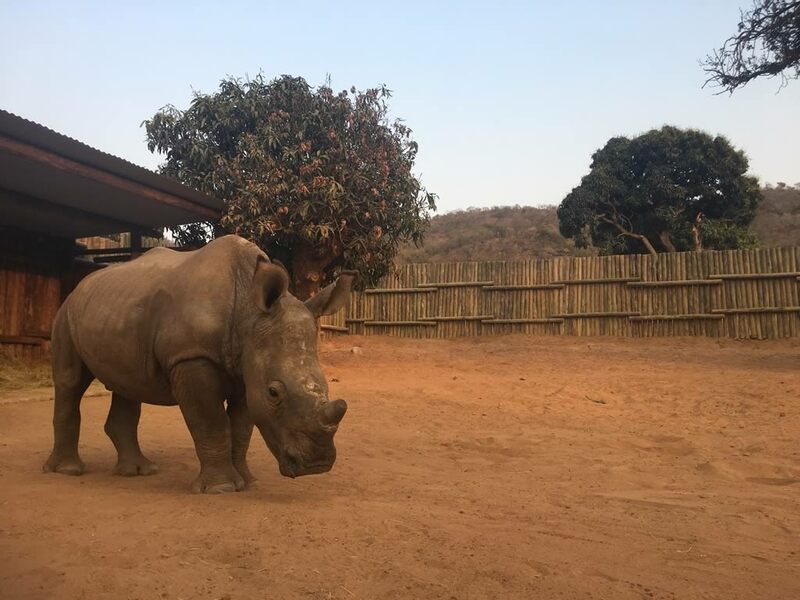 The newest arrival at Care for Wild Rhino Sanctuary settled in well and is affectionately known to staff and volunteers as Busiso, which means ‘Blessings’ in Swazi. He was found in the Nkomazi area after a few days of being alone in the bush. His mother and sister were both killed by poachers. He was chased down by a pride of lions, but was luckily saved by local rangers who chased the lions away. The following day, Busiso was seen seeking refuge with a crash of older rhinos, but they did not take him into group and the alpha male wounded Busiso under the neck with his horn. Busiso ran off into the bush and the field rangers lost track of him. Due to the thick fog and harsh weather, a helicopter could not be used, so a drone was sent out to search for the missing calf. As soon as they found him again, Petronel and her team from Care for Wild were immediately called in and Busiso was rescued and taken to the sanctuary. Busiso is approximately a year and a half old and has an appetite that could give The Rock a run for his money! Unfortunately, due to his injuries on arrival, Busiso requires the constant 24/7 care of our staff. Busiso has been moved out of the crate and into a nightpen that is full of grass and hay to eat and sleep comfortably on. His blindfold has been removed to reveal his beautiful eyes. We earned his trust over a few days and now allows us to dose him with medicine and get some milk in to him. We have tended to his wounds and are still closely monitoring him. Due to an abnormal discharge from his nose, we keep a close eye on him. Once Busiso’s nose cleared up and he felt better, Busiso broke through a fence to play with Lofo and Twinkle! Clearly feeling much better! Now the trio spend all their days and nights together, grazing and napping together, best of friends. We are proud to say that Busiso now weighs over 400kg and still growing! A healthy growing rhino boy. We would like to thank everyone for their messages of support and love towards our big boy Busiso.